It’s only the first week of July, but it already feels like a long, hot summer. Here in NorCal we’ve seen near-record heat including a week-long heatwave (seemed more like a month) with temperatures pushing, or exceeding 110°F…and that just was in June! What I’m really craving right now is a nice, juicy red wine. But it’s just too hot for a big, heavy Cabernet Sauvignon, Merlot, or Malbec. What is one to do??? No, not the young, fun, fruity Beaujolais Nouveau released in November. You should have finished all of that by now. I’m referring to the grown-up, big brother: Beaujolais Villages wines. Made from the same Gamay grape as the youthful Nouveau wines, “standard” Beaujolais is often aged in oak before release, giving it more depth of character while still retaining that light, refreshing flavor that can satisfy your red wine craving in the heat of summer. The Beaujolais region is located just south of Burgundy, but is actually part of the Rhone region of France. With a warm growing season, the resulting wines tend to be fruity, yet with proper care and aging, can develop complex flavors. The most prized Beaujolais wines are those from the 10 “crus”; those vineyards recognized as the best in the region. Wandering through my local Total Wine & More store the other day, I was in search of a red wine that I could pair with a grilled, New York strip steak that wouldn’t be too heavy in the sweltering heat. In a momentary flash of inspiration, I asked the store associate to direct me to the Beaujolais section. He gladly did so, but as I reached for the familiar label of the Louis Jadot Beaujolais (Retail $11.99), the clerk suggested I up my game. 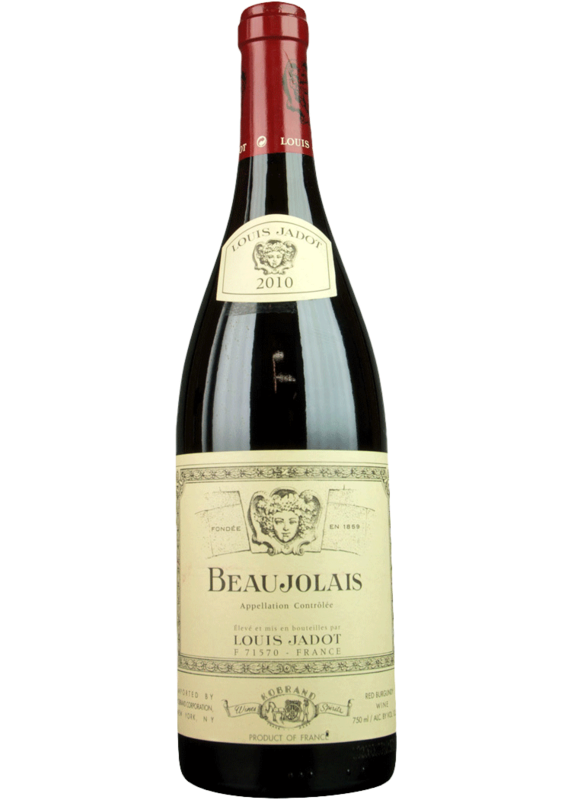 While there’s nothing wrong with the Jadot (and I bought a bottle for a BBQ that would be attended by less-discerning palates), for a mere $3 more, we could enjoy one of the best-of-the-best…a cru Beaujolais Villages wine. 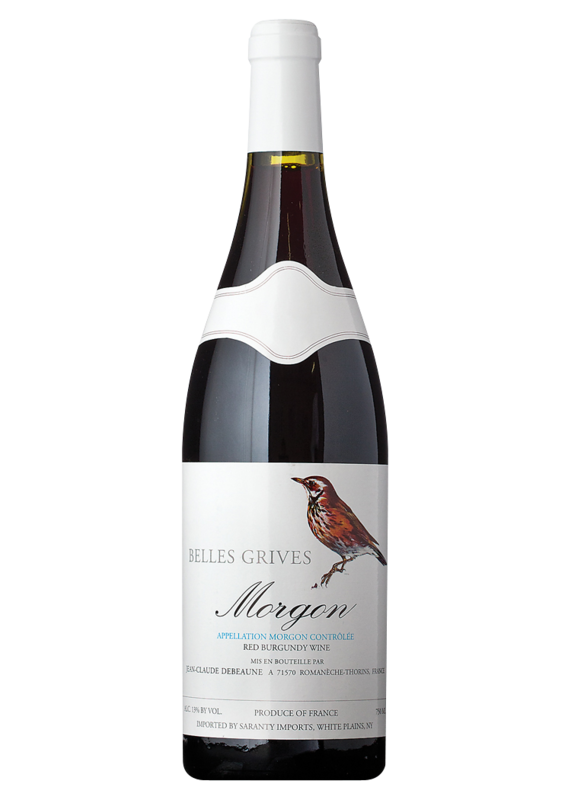 Powerless to resist, a bottle of Jean La Perriere Belles Grives Morgon 2014 landed in my cart. Morgon is one of the cru vineyards, producing superior Gamay. As you can see, the best quality can be had for a bargain price! As expected, my craving for red wine and red meat was satisfied that night. The steak was cooked to perfection, and with wine was magnificent; fruity and light, yet deep and complex. Good price point for a Cru Beaujolais. Brick red with garnet rim. Aromas of raspberries and black pepper. Flavors of ripe raspberry, earth, and smoke, with medium body and super soft tannins. Finish is long with red berry, plum, and baking spice. That’s not the end of the story, however. A few days later, we popped open the Jadot at the BBQ party. It was a huge hit, and complemented the Tri-Tip very nicely! Fruit-forward with raspberry and cherry, but less of the oak influence and depth, everyone loved it. That bottle didn’t last long! If you are already growing weary of summer, and can’t bear the thought of one more Rosé or crisp white, head down to your favorite wine shop and grab a bottle or three of a wallet-friendly Beaujolais Villages red wine. It’ll help you through until Cabernet season! Summer is the traditional season for Rosé wine. There is a movement afoot to encourage wine lovers to enjoy Rosé all year, and I’m all on board. I do enjoy Rosé wine year around. Nevertheless, lighter bodied, crisp wines taste best to me (any many others) when the weather is warmer. Poolside, lakeside, or parkside, a refreshing Rosé is a great way to enjoy a summer afternoon. Rosé wine comes to the plate with two strikes against it. First of all, many people I know still think all Rosé wine is like the syrupy sweet White Zinfandel popular in the 80’s and 90’s. This is simply not true. The reality is that a good many of the Rosé wines available today are crafted in the classic, Provençal style: dry, crisp, and refreshing. Still, some simply aren’t willing to give dry Rosé a try. I say their loss is my gain: more for me! Fortunately, there are also many excellent Rosé wines available! I found one of them recently at my local Total Wine & More store. Château Bélingard AOC Bergerac Rosé (Retail: $11.99) is a blend of 70% Cabernet Sauvignon and 30% Merlot. As one might expect from the use of these two big, bold red grapes, this Rosé has a bit more body and heft than most. Make no mistake, though; this is still a dry, crisp, refreshing wine! Founded in 1820, Château Bélingard is located in Southwest France, in the Bergerac appellation, east of the more famous Bordeaux region. While Bergerac wines are made predominantly with the same varietals as those of Bordeaux – Cabernet Sauvignon and Merlot based red wines, and Sauvignon Blanc and Sémillon based whites – Bergerac wines are often considered softer and less serious. I don’t take this as a criticism in any way! On the contrary, these are high quality, value wines! Not everyone is a collector or connoisseur, and there is definitely a need for affordable, easy-drinking, everyday wines. In addition to this Rosé, Château Bélingard produces an impressive portfolio of reds and whites, including a Sauvignon Blanc/Sémillon/Muscadelle blend, and several levels of Cabernet Sauvignon/Merlot blends. Below is my review of the Rosé, which we recently enjoyed as a cool refresher on a 102°F Sunday evening. Salmon, almost orange color. Aromas and flavors of tropical fruit including mango and passion fruit, with a hint of mandarin, along with light red berry flavors of strawberry and ripe raspberry. Dry with medium body and a soft, round mouthfeel and lively acidity make this a refreshing wine, yet big enough to pair with grilled tri-tip steaks or other summer BBQ fare. We really enjoyed this wine! I rated it 4.5 out of 5 stars (92 – 94 points). Check your local retailer and seek out some of this amazing Rosé wine! You’ll be glad you did! Today is Mother’s Day in the United States. I am fortunate, in that both of my parents are alive and healthy, in their early 80’s. What’s more, they live in a beautiful retirement apartment complex just a few minutes from my home. Over the years, we have not always lived so close; so many Mother’s Days were spent remotely. So I’m pleased to be able to celebrate this day over a meal and wine with both my mother and dad. Contrary to popular belief, at least by me, Mother’s Day is not just another “Hallmark Holiday.” Indeed, the day we know today was started in 1908 by Anna Jarvis, to honor the sacrifices mothers make for their children. Hallmark wasn’t founded until two years later in 1910! In 1914, President Woodrow Wilson signed a declaration establishing Mother’s Day as the second Sunday in May. Yet celebrations of motherhood date much further back than that. The ancient Greeks and Romans held festivals honoring the mother goddesses Rhea and Cybele. More modern Christian celebrations of “Mothering Sunday” eventually evolved into the holiday we enjoy today. I like to refer to the community where my parents live as a “land-based cruise ship.” It’s pretty much all-inclusive, with three meals a day, housekeeping services, social activities, recreation, and a shuttle bus for day trips and running errands. In fact, the apartments themselves don’t even have kitchens! Management is always gracious and invites guests for special occasion meals. Mother’s Day is no exception! Lunch is the big meal of the day, and there is always a main entrée, as well as an alternate in case you don’t care for the main. Mind you, these are chef-prepared meals so they’re always enticing and tasty! Today’s main entrée was marinated flank steak with hoisin sauce, with arepas and artichoke timbales. If you’re not feeling like beef, the alternate was crab cakes with papaya pepper puree and citrus dill aioli. When I come over for special meals, I always like to bring a bottle or two of wine to pair with the meal. After all, I am a wine guy, so my folks appreciate my recommendations! I went in assuming we would all want the flank steak, so I brought a Cabernet Franc; the Le Pré Vaujour Chinon 2016. However, it was possible that my mom would surprise me and order the crab cakes. Besides, this is Mother’s Day, so we have to have a Rosé, right? As you can see in the photo above, we had several Rosés to choose from. 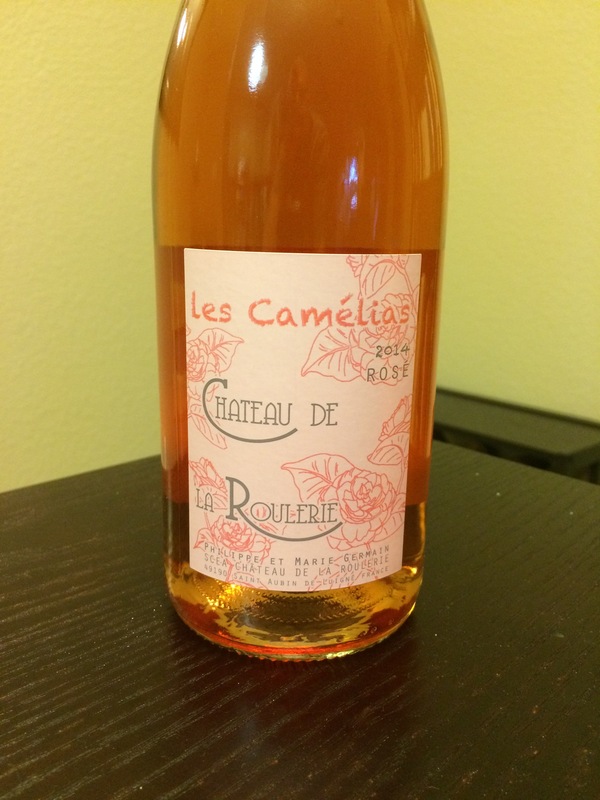 In keeping with the Cabernet Franc theme, we opted for the Château De La Roulerie Les Camelias Rosé 2014, a blend of 50% Cabernet Franc and 50% Cabernet Sauvignon. Roses and Rosé for Mother’s Day! OK, props to dad, too. Without him, she wouldn’t be my mother! ​Salmon color in the glass. Aromas and flavors of strawberry, red raspberry, and red currant. Bright acidity with medium body. Light and lively. Red berry, including cranberry on finish. Excellent pairing with the spring and micro greens salad with endive. Yes, 2016. ​Very young, but very good! 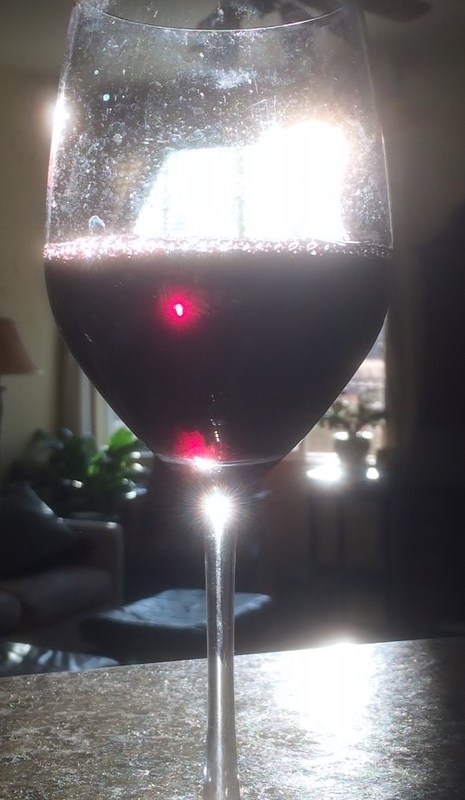 Bright purple color in the glass. Aromas and light mouthfeel are reminiscent of a Beaujolais Nouveau: Fresh raspberry, red currant, and violet, with some spice, and a bit of freshly tilled earth, with just a hint of oak influence. Surprisingly soft and smooth for such a young wine, with lively acidity and medium body. The acidity made it perfect with the flank steak, and led to a long, pleasing finish. Very good now, with aging potential for several years. My hope is that each of you enjoyed celebrating your mother as much as I did mine. 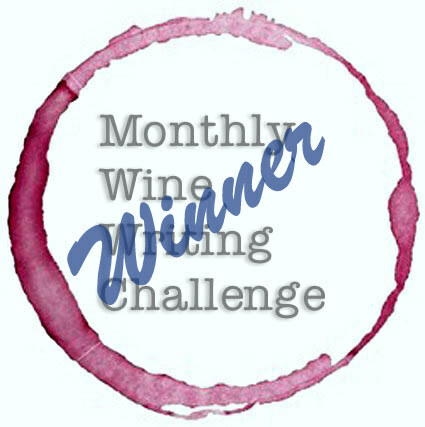 Let me know in the comments what you did with your mom, and what wines you paired with it! 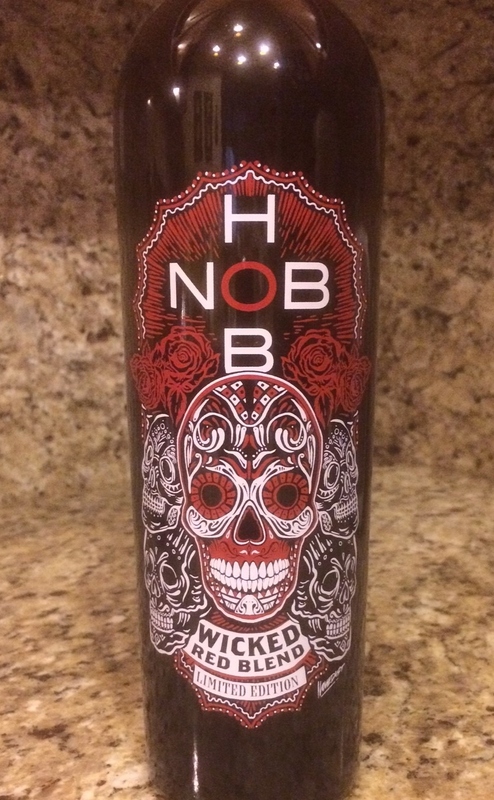 Just in time for Halloween comes the limited edition Hob Nob Wicked Red Blend. Sporting a Calavera, or “Sugar Skull”; the traditional Mexican Dia De Los Muetros symbol; on the label, this wine actually hails from France. The Languedoc-Roussillon region, to be precise. As stated on the label, this is a Limited Edition wine, released each year around Halloween. It is a great wine to bring to an All Hallows Eve party; full of surprises and devilishly good. The Languedoc-Roussillon region is known for excellent wines at outstanding values. Hob Nob Wicked Red Blend is no exception. A traditional blend of Grenache and Syrah, with some Cabernet Sauvignon as well, the folks at Hob Nob threw a surprise into this blend: Pinot Noir. The Pinot adds zing; a brisk acidity and layers of complexity to make this wine the life of the party! With plenty of backbone and structure, plus lively acidity, it pairs with a variety of foods; even a juicy grilled rib eye steak! I got mine at Total Wine & More for $8.99. Tasty wine at a scary-good value! Get some, before it vanishes! Sauvignon Blanc has enjoyed a recent rise in popularity . Although Chardonnay remains undisputed king of the white wine world, Sauvignon Blanc is achieving status as the latest trendy wine. All the cool kids are drinking it! I normally shun trends, but I am completely on board with this one. Sauvignon Blanc is crisp and refreshing; great for a warm summer day. It is food friendly, pairing well with white fish, chicken, pork, grilled vegetables, and salads – basically any light, summery food. And it’s affordable! Whereas Chardonnay can run upwards of $40-50 for a midrange bottle (and hundreds for a Grand Cru White Burgundy), the most expensive Sauvignon Blanc at my local Total Wine & More store, a White Bordeaux, is just $54, with the second most expensive being less than $40 . Good Sauvignon Blanc is available for as little as $8 to $12. Sauvignon Blanc grows well in wine regions all over the world. It has adapted well to the southern hemisphere, with some of the most award-winning wines coming from New Zealand. This summer, I have enjoyed a “world tour” of Sauvignon Blanc, enjoying examples from France, Australia, New Zealand, Chile, and California. The California wines I’ve had have come from Mendocino, Napa, Sonoma, and Lake Counties, Clarksburg, and San Luis Obispo. Yes, I drank a lot of Sauvignon Blanc this summer! I have found I prefer California Sauvignon Blanc, with my favorites coming from Mendocino and Napa. However, I recently enjoyed a truly delightful example from Clarksburg. Nestled along the Sacramento River, less than 30 minutes south of the capital city, Clarksburg is a hidden gem of a wine region. The wines are spectacular, and generally substantially less expensive than nearby Napa or Sonoma. 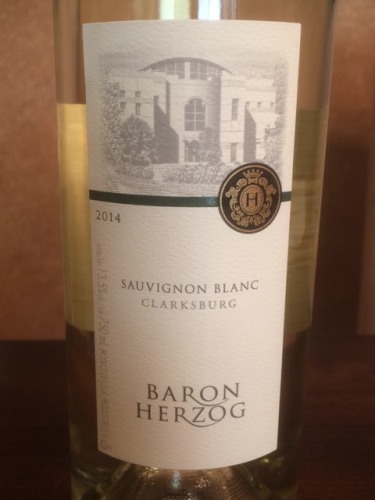 Baron Herzog Sauvignon Blanc 2014 is one of these excellent, affordable wines. It is available at my local BevMo store for $10.99. I found it at Trader Joe’s for just $7.99! Pale straw color, with aromas of lemon-lime and pineapple. The mouthfeel is light, with lemon/citrus, pineapple, fresh white peach, and tart apple notes. The acidity is bright and crisp, and the finish lingers with zesty citrus, and a hint of sweet elderflower in the back of the throat. A very nice Sauvignon Blanc from California’s Central Valley, and a great value at $8! If you haven’t tried Sauvignon Blanc in a while, do yourself a favor and get some. Even though the calendar says it’s autumn, the weather still says “summer” here in NorCal. Sauvignon Blanc is a great way to relax and refresh. Cheers!